I love a good bagel, but we don't usually keep them around the house because they would go bad before we would eat them all. 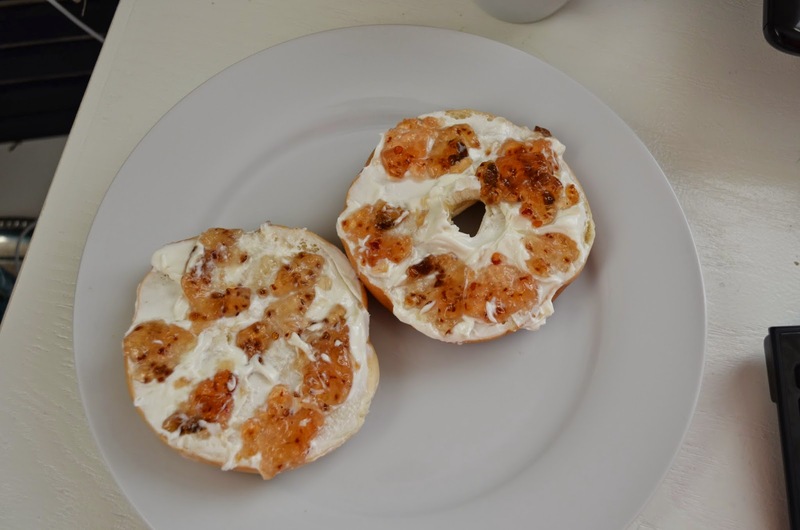 Recently, we had some houseguests who requested bagels for breakfast and the toppings on these bagels has me hooked! I had first tried this topping on some crackers at a Bed and Breakfast in South Georgia, but I never thought to try it on bagels! First, toast the bagel to your liking. Then spread on plain cream cheese and top with raspberry jalapeño jelly! I paired my bagel with a yummy cup of joe! Since I don't have time to make it to the closest Starbucks every morning, I purchased a large bottle of their flavored syrup so that I could make my own Starbucks at home! This breakfast didn't last too long, but it was a nice weekday treat to munch on while I was working!